Last night was a very special evening for me. 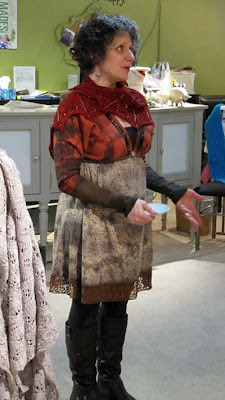 I went to a meet and greet at a local yarn store, Make One, as they were hosting designer and teacher, Sivia Harding. I've been wanting to meet her for a number of years as I've done test-knitting for her. She creates beautiful designs and her patterns are a pleasure to knit. Working with her has been a treat. I had the pleasure of testing two shawl patterns: Harbour Lights and Norwegian Woods (Ravelry links). We've been emailing for years and it was so nice to finally meet her and she is a delight. I also knitted another of her designs, this one was a Christmas gift for my daughter, the Hanging Garden Stole. I can highly recommend her wonderful patterns. I succumbed to temptation last night, too, and signed up for a class. I'm going to be taking a class to learn about dyeing yarn. Uh oh.... I wonder if I've embarked on a new obsession? The class is on March 17th at Make One. Baby bootie update: I don't know if I'll get these booties done by tomorrow morning. I'm about halfway through the first one (almost noon as I'm writing this). I've got season two of Downton Abbey from the library and I plan to settle in for the next few hours, watching and knitting.